The Dr Liam Fox was first elected in April 1992 and was returned in the 2015 election with a resounding 23,000 majority. 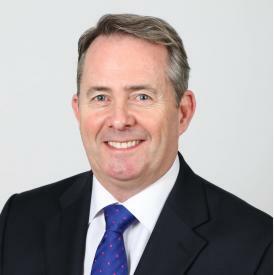 In 2016 he joined the cabinet as Secretary of State for International Trade. He was born in East Kilbride in 1961, grandson of a miner, educated at the local St Bride's High School, went to Glasgow University and qualified as a doctor. He is a member of the Royal College of General Practitioners and has previously worked as a Civilian Army Medical Officer, as a divisional surgeon for St Johns Ambulance, and later as a GP in Buckinghamshire and Somerset. He has had a varied political career. In June 1993, he was appointed Parliamentary Private Secretary to Michael Howard, then Home Secretary. In July 1994, he was appointed an Assistant Government Whip, and promoted to the position of Senior Government Whip the following year. He was a Minister at the Foreign and Commonwealth Office from 1996 until the 1997 General Election. In June 1997, Liam was appointed Opposition Front Bench Spokesman on Constitutional Affairs. For four years from May 1999 to November 2003 he served as Shadow Secretary of State for Health before being appointed Co-Chairman of the Conservative Party in 2003. Subsequently, from May 2005 to December 2005, he served as Shadow Foreign Secretary. He held the role of Shadow Secretary of State for Defence from December 2005 until the General Election in May 2010, after which he was appointed Secretary of State for Defence - a role he held until 14th October 2011. He has lived in Somerset for over 25 years and lives within the constituency with his wife, Jesmé, in Tickenham. Your views matter, and I am keen to make a difference to our community. If I can help in any way, or if you want to let me know what your concerns are, please get in touch.